Here are some excerpts from the last meeting which was perhaps the most acrimonious and the two sides decided to present separate drafts of the same bill. Pranab Mukherjee: I welcome you all to this ninth meeting of the joint drafting committee. Yesterday, we mentioned about the confirmation of the minutes of seventh meeting, which was circulated yesterday. If you do not have any problems, we can confirm the minutes. Secretary: Para 5.1 of the minutes, page eight... In line eight...instead of the word "wonder"... it is "questioned "... and then the next sentence was deleted... Minister of Home Affairs was of the views that these powers cannot be given to the Lokpal...he has said that these need not be mentioned and then further down, when we are referring to Mr Kejriwal's statement - Shri Arvind Kejriwal made a statement that the CBC makes recommendations but its recommendations are never acted upon... Minister of Home Affairs informed that in his capacity, earlier as Finance Minister and now as Home Minister, he had almost never disagreed with the recommendations of the CBC. Secretary: Yes sir... So, there was a slight error in our recording, so we are correcting that. Pranab Mukherjee: Is it agreed upon? Prashant Bhushan: Prashant Bhushan said that none of them had made any specific charge against any member of the committee - that is fine. One line should be added after that - He said that the charges were against the government and the Congress party. Pranab Mukherjee: What do you want to add? Prashant Bhushan: One sentence which says he said the charges were against the government and the Congress party. Pranab Mukherjee: You have corrected it? You have noted it? Secretary: We have corrected it. With this minutes would be confirmed with these two amendments? Pranab Mukherjee: Yeah, with these amendments. Any other? Prashant Bhushan: No, it's okay. Pranab Mukherjee: Then you should confirm it. As was agreed yesterday, I would request the secretariat to circulate the copies of draft Lokpal bill to all the members of the Joint Drafting Committee of the Lokpal bill. Has it been circulated? Secretary: Yes, we have the copies sir. Santosh Hegde: Accountable to the court. Kapil Sibal: Ordinary persons don't dare complain against any enforcement agency. We all know that. This is the rule of... this country, we have seen it. That's the fundamental issue. Salman Khurshid: But you only said we are removing sanction? Kapil Sibal: What is the protection to a government servant to a parallel government that is not accountable to anybody? Today the executive is accountable. That's the problem. 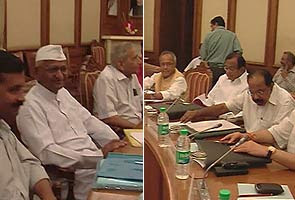 Pranab Mukherjee: We all have to discuss all this. Just one small clarification from your draft - Page 13C... functions of the Lokpal. After completion of investigation in any case involving an allegation of an act of corruption, to impose punishment of dismissal, removal or reduction in rank against government servants after giving them reasonable opportunities of being heard. That means here in this case even dismissal can take place after completion of investigation, not necessarily of the trial. Is that the meaning? Pranab Mukherjee: No, no. I am not entering into argument. I just wanted to know that even before commencement of the trial, after the completion of the investigation to the extent dismissal of the public servant is possible? Arvind Kejriwal: It happens today also. Today, the power to order dismissal after departmental enquiry lies with the department. The prosecution takes place parallel in the court. The same powers are there. All that we are doing is transferring the same powers from the department to the Lokpal. That's all we are doing.